Happy birthday Beverly Brodsky (Buffalo) and Eileen Spinelli (The Best Story; Somebody Loves You, Mr. Hatch). It’s the birth date of Marchette Chute (1909-1994), Stories from Shakespeare, The Wonderful Winter, Beatrice S. de Regniers (1914-2000) May I Bring a Friend?, Matt Christopher (1917-1997), The Kid Who Only Hit Homers, and Diana Wynne Jones (1934-2011) Howl’s Moving Castle, Castle in the Air. British Intelligence officer, T. E. Lawrence (1888-1935), known as Lawrence of Arabia, was born on this day. In 1954 the first edition of the magazine Sports Illustrated is published. Read Bring your “A” Game: A Young Athletes Guide to Mental Toughness by Jennifer L. Etnier. It’s National Tell a Joke Day. Read Pearl and Wagner: One Funny Day by Kate McMullan, illustrated by R. W. Alley. As the Almanac has evolved, frequently I get ideas, directly or indirectly, from the readers of this column. Every year John Schumaker, @MrSchuReads, takes a character from a beloved children’s book, travels with it, and takes photos that he shares on his website. You can see his video of his trip with year on Read, Watch, Connect. As John was tweeting about his forthcoming trip, I asked myself the question, “Who would I want to be on vacation with?” And the answer came immediately. 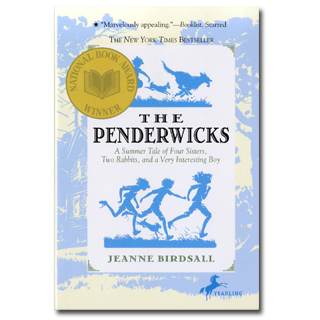 In fact, Jeanne Birdsall’s The Penderwicks takes place in three weeks in August in a perfect vacation spot: Massachusetts’ Berkshire Mountains. Meet the Penderwicks. As the subtitle states, this is A Summer Tale of Four Sisters, Two Rabbits, and a Very Interesting Boy. Having lost their mother to cancer, the four Penderwick sisters work together and support their father, an absent-minded but loving, botanist. Because their vacation reservations on Cape Cod fell through, they take a chance on a cottage in the Berkshires and find that it’s located on the grounds of the Arundel estate, a seemingly magical place with an evil owner and her very attractive son Jeffrey. All of the sisters have distinct personalities—Rosalind is the caretaker; Skye, math expert; Jane, the writer; and Batty, the youngest who loves her dog Hound. Hound feels equally enthusiastic about Batty. With secret hand signals, the Penderwick code of honor, and ties that bind them together, the girls quickly pull everyone on the estate—including Jeffrey—into their activities and mayhem. Although their escapades seem innocent enough—interrupting a garden party with a soccer match, for instance—the book provides just enough intrigue, romance, excitement, and adventure to keep readers enthralled with this summer vacation. Those who have read Louisa May Alcott, E. Nesbitt, Eleanor Estes, and Edward Eager will see similarities to beloved books by these masters. But Birdsall has managed to make her family thoroughly modern and believable. With no tricks or flimflam, just good old-fashioned character development and writing, she builds a book that many readers list as one of their favorite of the last decade. How I wish I could be there with them in Arundel. So I’ll see if the Penderwicks will stuff me into the back of the car with Hound. And in the meantime, I’m going to reread this glorious book and its sequels. Mr. Penderwick believed in long walks. One of his favorite sayings was, Take a walk, clear your head. Skye figured that’s why he had sent her on a walk with Jane, Jeffrey, and Batty while he and Rosalind aired out the kitchen. For Skye to clear her head and, maybe, too, for Skye and Jeffrey to clear the air between them. Not that Skye hadn’t already apologized for calling Jeffrey rich and stuck-up and not that Jeffrey hadn’t said that was all right, forget about it, but that was as far as they had gotten, conversationally, and since then, they had barely looked at each other. So here was Skye, slogging along behind Jeffrey and Jane, listening to them gab on and on like old friends. It was enough to make a person sick. Originally posted August 16, 2011. Updated for . This sounds very much like the kind of book I would have adored as a kid. I think I’ll have to pick this one up. I love all three and hope Jeanne keeps writing them! Nothing says summer like those Penderwick sisters! I love picturing you in the back of the car, Anita, with Hound slobbering all over you. Thanks everyone for the comments. Audrey, yes, I particularly like the image of Hound slobbering over me. I have two Bernese Mountain Dogs who do this daily. One of the things we love is how the girls each have strong personalities–and yet they’re hardly one-dimensional. Skye and Jane have their academic strengths, and could hardly be more different in this way, except that they’re both highly competitive soccer players. And Batty could easily have devolved into no more than the cute littlest sister, but her perspective is felt as keenly as the other three. And Hound…what a perfect dog! I’m with you, I’d love to be a Penderwick. Erika: Thanks. Arundel now correct! Just read the first chapter. Between Mr. Penderwick and Hound, I don’t feel so out numbered. On to the second chapter. Carrie: We are on. But, yes, let us hope Hound hasn’t eaten! I just finished this book the other day and was enchanted. This reminds me of some of my favorites as a child and (luckily in many ways for me) my own childhood. My sister and two neighbor-girls built an intricate system of paths, club”houses,” and landmarks in the woods behind my parents’ house and we spent hours developing maps, secret code names, and having adventures. I think 3 weeks at Arundel would’ve been heaven for us. I am so interested in the super-modern way Birdsall presents the text while still writing a timeless novel that feels as though it could’ve been penned in the 1950s. Skye being encouraged to be “gentlemanly” if that is what is best for her is mixed with the idea of fierce family loyalty above all else. Beauty. I am looking forward to reading the sequels. Discovered the audio books a few months back. Readers these days are fantastic, all the voices different etc. I love the Penderwicks and can’t wait for #4! In the meantime listening again to all three occasionly. Meg: Reading number four in galleys — it is definitely worth the wait. I’ve read this series now, and I absolutely cherish these books! Please hurry with the last one. Gordon — your response and others to this series make me believe they are headed for classic status, one of the best series of our time.